Since that dreadful call on Christmas Eve, I have been consummed with fears and questions, both of which have yet to be relieved or answered. Abbigail has had an MRI and ultrasound of her liver since returning from transplant and they both reveal the same differential diagnosis and affirmation of my fears. These nodules found to be growing and multiplying within her liver, aside from her never disappearing liver tumour treated with 8 cycles of chemotherapies last year, are suspect of further metastasis, PTLD (post transplant complication involving further cancer) or infection. We have consulted with liver specialists and infectious disease and they have all suggested a biopsy to evaluate a tissue sample from the “spots” to see what they are because blind treatment could result in further damage. So could time…I am pushing as hard as I can to get these procedures and tests completed as soon as possible because in my heart and my gut, I don’t feel this is “nothing to worry about” and time has only hurt our baby girl in the past. So as Abbigail struggles most days to keep her temper under wraps, tame her irritability and muster the energy to be a kid, we are worrying and trying to get everything organized to face anything thrown our way. We thought for sure we would be enjoying a new life by now, but despite the odds we are continuously being thrown, we won’t stop fighting! This fight is nearing three years and this past year we have received more support and generosity than ever before…than we could have ever dreamed of or prayed for. We have so many people, families and organizations to thank. We will post a formal thank you to everyone shortly and hope that everyone knows just how much each and everyone of you means to us and how much we appreciate your support; whether it be monetary, emotional or through prayers and kind words. We thank you ALL! 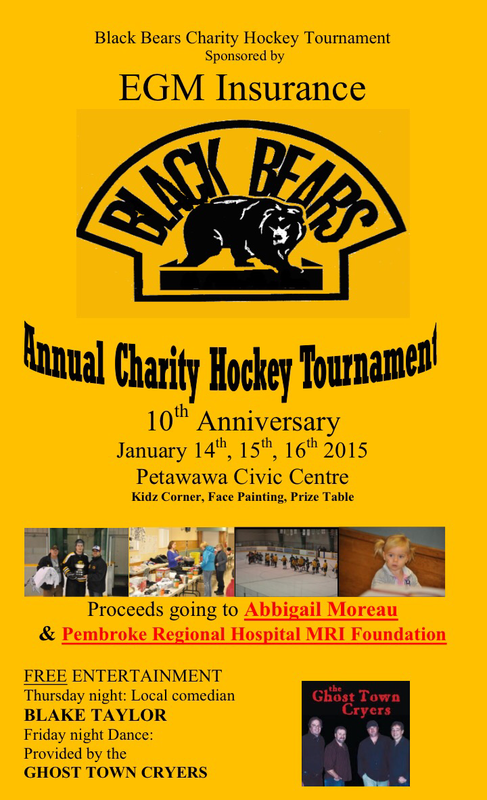 One of the recent fundraisers, in support of Abbigail, is the CNL Black Bears Charity Hockey Tournament being held this week. 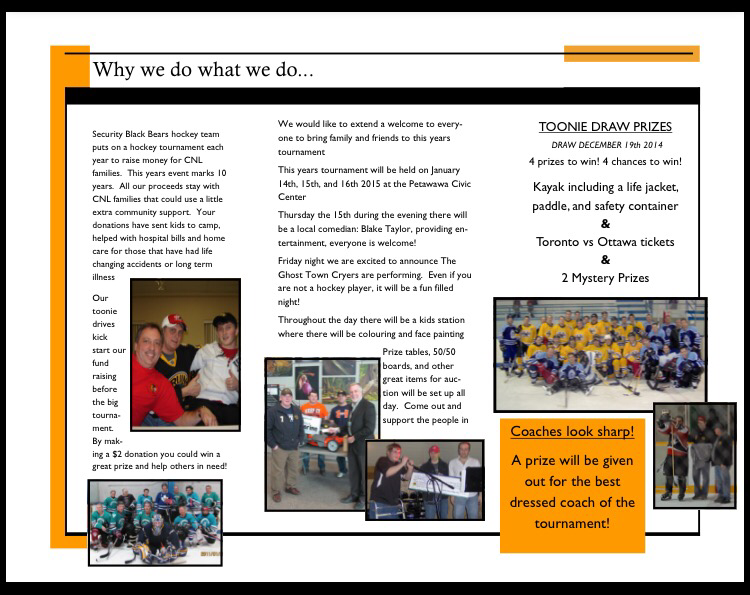 Colleagues of mine at CNL (Canadian Nuclear Laboratories – formerly AECL) have for ten years raised money, for local charities, through their annual hockey tournament. Last year they raised a huge amount of funds which were in support of both the Pembroke MRI fund as well as a colleague family with a child in medical fragility. Much the same this year they have again chosen the MRI fund in addition to Kisses For Abbigail. We couldn’t be more blessed and humbled by this. 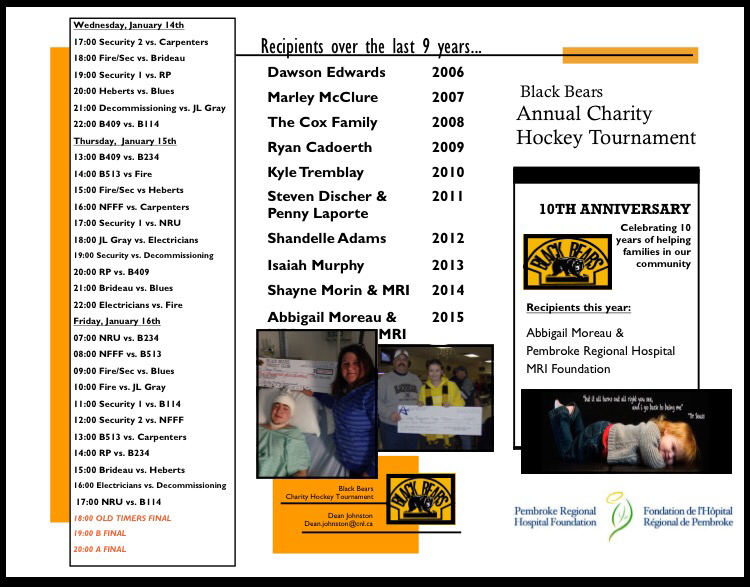 We would love for our family and friends to go out and support this huge team of generous and kind heart hockey enthusiasts who chose Abbigail to pray for and raise funds for this year. We hope that everyone has a week of fun filled ice time while we continue to look further into Abbigail’s liver tumours and we look forward to hearing about all of the fun the kids had during the festivities. Please send me photos of the event, Abbigail will one day look back on her supporters throughout her battles. Fun with Abbigail on Facebook!